A superb finish for his first Derby County goal ensures that Marcus Olsson becomes part of East Midlands derby folklore. It was the winner against Nottingham Forest, in an otherwise lacklustre game between these near neighbours. It is a valuable three points for fifth-placed Derby, who move to within two points of Hull City in fourth. Forest came up with the grand total of one shot on target, making it a miserable end to a week that started with Dougie Freedman getting the sack. Read Owen Phillips' full report from the iPro Stadium here. For today, that's it from us. Derby County captain Richard Keogh tells Sky Sports: "Marcus scored a great goal and both teams played well. "We have to keep working hard now. If we keep playing like that, we'll see where we go." Derby remain fifth in the table but are now only six points behind second-placed Middlesbrough. 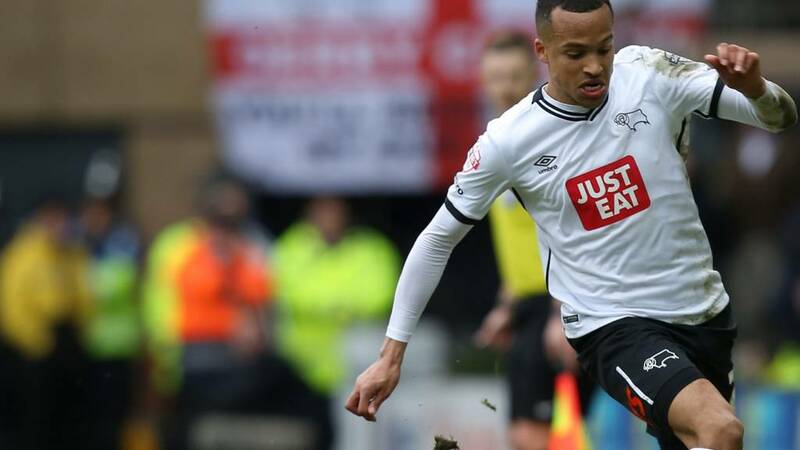 Derby County's goalscorer Marcus Olsson tells Sky Sports: "It was a great feeling scoring that goal. The atmosphere has been great and we are happy to get the three points." Marcus Olsson comes up with the winner in the East Midlands derby. Now that is one memorable way to score your first goal for Derby. The corner comes to nothing. Whistles ring out across the iPro Stadium as home fans want this one to end. Jamie Ward with a snapped effort at goal for Nottingham Forest. Lacks power of any description and Scott Carson collects. Dexter Blackstock won a fine header to set it up and now wins a corner for Forest. We are into the first of five minutes of injury time. Derby's George Thorne throws his body into a fine block-tackle. That looked crucial to deny Ben Osborn just inside the area. Into the final minute of normal time. Home fans making plenty of noise, Nottingham Forest making no inroads. Nottingham Forest have just three minutes of normal time remaining to salvage something. What they need to do is get a shot on goal. Just saying. Dexter Blackstock comes into the action with seven minutes remaining, replacing Ryan Mendes. The tempo has cranked up. With a free-kick, Derby go close as Chris Martin has a header deflected over for the Rams. Corner comes to nothing. Tempers flare in a big way as Scott Carson is clattered coming to collect the corner. Players rush in after Matt Mills pushes Richard Keogh. A yellow card seems fortunate for Mills. And Keogh goes in the book as well. So both captains then. Derby's Jake Buxton gets a standing ovation from home fans as he comes in for his first league action for a year. He replaces Jason Shackell. And Buxton is back there to help defend a corner. Nottingham Forest look as if they had all angles covered as Derby play the ball around the edge of the box. But the ball breaks at the top of the area and Tom Ince plays a fine ball in for Marcus Olsson, who picks his spot superbly and places his effort inside the far post, beyond the diving figure of Dorus de Vries. A breather at the iPro Stadium as Derby defender Jason Shackell gets some treatment. The bosses get messages to their players, who also get a drink of water. Exciting stuff... not. Derby's Tom Ince has looked as likely as anyone to create or score a goal, but a few near things have been characteristic of a game that has still barely produced anything other than a couple of half-chances. The home crowd are sensing their team are getting on top, but we are still waiting for the game to offer more than plain old endeavour and commitment. It needs to hurry up. Tom Ince trying to pickpocket Nottingham Forest. He pounces on some confusion in defence and wins the free-kick on the left wing. A poor delivery lets the Rams down. Nottingham Forest with their second change. On-loan Cardiff striker Federico Macheda makes way for Oliver Burke. Derby's Johnny Russell plays a wonderful ball out to the left and the ball is hit into the box first time by Marcus Olsson. Michael Mancienne needing to get a touch to clear for Nottingham Forest. Fine movement by Olsson on the edge again. Russell showing he is a danger. First shot on goal. I repeat, we have a shot on goal. Derby's Tom Ince is the man with the effort. Forest goalkeeper Dorus de Vries deals with it easily. Derby County with the first change, Johnny Russell replacing Bradley Johnson. For Nottingham Forest, Jamie Ward makes his return to the iPro Stadium - where he spent four and a half years as a player - replacing Chris Cohen.